At just 21 years old, Ciara has matured in her music much more than her age would have us expecting. She proves herself with her sophomore release The Evolution, which she co-wrote all of the songs and co-produced many of the tracks on. The album is not only what we would anticipate from someone who has been associated so closely with Crunk and B but it brings something more to the table. Her ability to get us up out of our seats is as good as her skill with solid emotional songs. Working with influential players like Pharrell Williams, Will.I.Am, Lil Jon and Rodney Jerkins among others proved positive to further shape the Ciara sound. The club bangers we have come to rely on her for are plentiful. In fact the CD starts off with a bang as Ciara's southern drawl creeps out and Lil Jon kicks of the party song "That's Right." The Atlanta native's love for dance is apparent as songs like "Get Up" featuring Chamillionaire and "Bang It Up" beckon everyone to the dance floor. 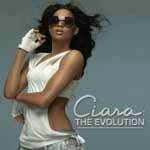 Ciara doesn't fail to mix it up with sexier love songs like "Promise" and "Can't Leave 'Em Alone" featuring 50 Cent. The album eases into a smooth ending with tracks "So Hard," "I'm Just Me" and "I Found Myself." Though you have to wonder when listening to the last track how much Ciara could have figured out about herself at such a young age, she is very convincing in her convictions. A couple of the tracks barely make a hard hitting connection but still demonstrate that signature sound that Ciara seems to make work. "Make It Last Forever" bites the background from Rob Base's "It Takes Two" and blends a whole new beat that definitely pulls off a distinctive sound. With short interludes, Ciara breaks up her CD with smart transitions and by the time The Evolution makes it's full cycle, you come out feeling pretty positive.